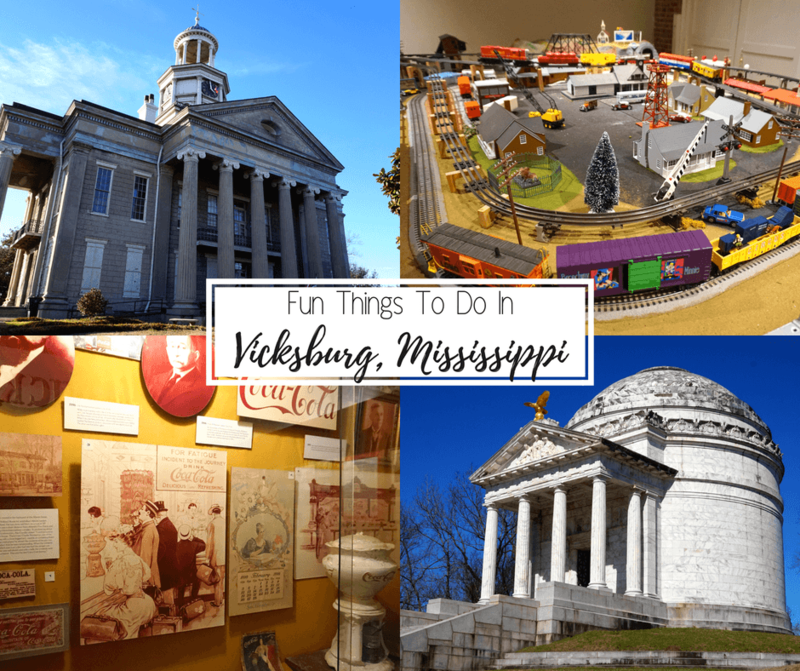 There are so many fun things to do in Vicksburg, Mississippi! From historic battle grounds to world class casinos and restaurants, this city has something for everyone! There’s a lot more to this city than people think! It’s a mecca for history buffs because of the city’s significance during the Civil War, but Vicksburg was an important river town before that and has since been responsible for many inventions and creations. So if you’re looking for fun things to do in Vicksburg, keep reading. We know you’ll find something for everyone in the family. Without a doubt, the most popular of the Vicksburg attractions is the military park. Both Civil War history buffs and casual tourists alike will enjoy this park that preserves the site where the Siege of Vicksburg took place. We suggest starting off in the Visitor’s Center and watching a 20 minute video that gives the history of the battle. Then, hop in your vehicle and get ready to explore the park. The roads through the park are marked and you can get a map at the Visitor’s Center. However, we highly recommend hiring a licensed battlefield guide. The extremely knowledgeable guide goes along with you in your car and explains significant areas along the way. You can find more information on a guided tour here. There are over 1400 monuments and memorials throughout the military park, each commemorating the veterans of the siege (both Union and Confederate) which lasted 47 days. We thought the most impressive of the monuments was the Illinois State Memorial. It was built to resemble the Roman Pantheon and inside are 60 bronze tablets with the names of all 36,325 Illinois soldiers who participated in the Siege of Vicksburg. The outside stairway has 47 steps, one for each day of the siege. Vicksburg National Military Park is also home to the USS Cairo, a Union ironclad gunboat that was sunk during the Civil War. It was actually the first ship in history to be sunk by an electrically detonated torpedo. It went down in 12 minutes but luckily no lives were lost. The ironclad stayed underwater for almost a century, with the mud and silt preserving a lot of items which can now be seen in the USS Cairo Museum. Vicksburg antebellum homes are pretty incredible. We thoroughly enjoyed each of the four Vicksburg historic homes that we toured during our trip; we loved the period furniture, architecture, and of course the history associated with them. Our favorite of the Vicksburg mansions was Duff Green Mansion. It is now a beautifully restored B&B and every morning after breakfast they offer a guided tour of the home. You can read more about The Duff by clicking here. Anchuca is known for its Greek Revival style; it was the first Vicksburg mansion to have columns! It is also well known because at one point it was the home of Joseph E. Davis, the brother of Confederate President Jefferson Davis. In fact, while visiting his brother in 1869, Jefferson Davis addressed neighbors and friends from the front balcony of Anchuca! Anchuca has a very unique stairway! Another one of the beautiful Vicksburg mansions is Cedar Grove. The gardens and fountains are lovely, but what stuck out to us about this historic home is the Union cannonball that is still lodged in the parlor wall! Yes, Atlanta is the birthplace of Coca-Cola. But did you know it was first bottled in Vicksburg? Visitors to the Biedenharn Coca-Cola Museum can learn all about Joseph Biedenharn and how his idea to bottle the popular drink made it more accessible to people in more rural areas since at the time it could only be found in cities with soda fountains. The museum is located in the building Biedenharn originally built to sell candy. Besides the history of the Biedenharn family and the bottling process, visitors can also see plenty of Coca-Cola memorabilia and even buy a Coca-Cola Float. It’s one of the top Vicksburg tourist attractions! The Biedenharn Coca-Cola Museum has a lot of fun items, including an original soda fountain! Yesterday’s Children Antique Doll and Toy Museum has over 1,000 dolls and toys! This is another great stop for Civil War history buffs. The museum is inside the courthouse that once served Warren County. The building itself is impressive with its original iron doors and shutters. Inside there are many unique items, including a tie worn by Jefferson Davis during his inauguration. Aside from Civil War items, there are also many pieces that highlight the history of Vicksburg. There are Native American items, antebellum clothing, and antique furniture. Did you know shoes were first sold in boxes in Vicksburg? Vicksburg sits right along the mighty Mississippi. This river has played an important role in the history and growth of the city and this museum pays homage to that. Inside, there are displays showcasing native fish, interactive models of the Mississippi River, and exhibits that tell of the Great Mississippi Flood of 1927, considered the most destructive flood in the history of the United States. If you’re traveling to Vicksburg with kids, we think they’d enjoy this museum. The interactive exhibits inside the museum are fun, but there is also a steamboat outside of the museum that visitors can walk through. There are original pieces, photos of the boat during its working days, and interactive exhibits like a boat simulator. This museum has a little bit of everything, so we think everybody would enjoy it. There’s a large model depicting the Siege of Vicksburg, model train sets, a large collection of model Civil War gunboats that were all named Mississippi, and much more. We especially loved the train sets, as they reminded us of some of the ones we’d seen at the Roads and Rails Museum in Frederick, Maryland. If you’re wanting to do some shopping in Vicksburg, we recommend stopping at the Levee Street Marketplace. There are antiques, clothes, jewelry, and even homemade baked goodies! Take your time walking around so you don’t miss anything. Lots of fun items to buy! This artwork along the Mississippi depicts the history of Vicksburg in over 30 murals. They are painted along the flood wall on Levee Street and each has a small placard in front of it explaining the mural. We loved walking along the street and seeing paintings of how the city first looked, steamboats, and famous Vicksburg musicians. Feeling lucky? No list of Vicksburg attractions would be complete without mentioning the casinos in Vicksburg. There are a few along the river, but we were only able to visit Lady Luck during our trip. Along with over 600 machines to play on, the casino also has great bars and restaurants. You can also stay overnight at Lady Luck. We spent a night there and loved that our room had a hot tub! To check rates, you can click here. Lady Luck Casino has over 600 machines! While exploring all of these fun Vicksburg attractions, you’re bound to get hungry. Fortunately, Vicksburg has a lot of great places to eat. From classic home cooking, to quirky roadside snacks, Vicksburg has it all. There’s even a brewery in the middle of downtown! You can find out which Vicksburg restaurants were our favorites by clicking here. We really enjoyed our visit to Vicksburg. We’re history nerds so we loved learning more about the Civil War in a city where the course of the war changed so much. But we also liked that there was so much more to the city. And we know that Vicksburg is going to keep growing and building new attractions, so we definitely can’t wait to return. Thank you for visiting with us at Levee Street Marketplace! I hope you had a pleasant and fun time while visiting. Hope you’ll visit again when back in our neighborhood, it changes in here daily. We appreciate your feedback & recognition of our fun and exciting business! Wow, Vicksburg certainly does have a lot to offer the history buff! I’d probably enjoy exploring the historic homes. McRaven House definitely does look like a place that could be haunted, doesn’t it?! I would love to learn more about the Civil War and visiting the Vicksburg Military Park would be great for that – we would definitely get the guide to drive around with. Like you, we are history geeks, so all the museums and historic antebellum houses in Vicksburg are a big draw! We are planning a trip to that area next year, so will pin this! I did a trip that passed through this region many decades ago but I don’t recall spending much time in Vicksburg, which looks like a mistake. I’m a great fan of historical sites that offer a learning experience. And that coca-cola museum looks fascinating too. Bric a brac stores like Levee Street Marketplace also appeal. Did they tell you anything about exactly how that canon ball got lodged in the wall at Cedar Grove Mansion? I’d definitely be curious about hearing if that happened in a battle or was some sort of accident. I usually avoid visiting anything related to the military, but the Vicksburg Military Park looks an interesting place. I would like to know how that canon ball got lodged in the wall? Do you have any idea? Amazing that the Cairo went down so quickly, bu nobody died. They must have been well-drilled in escape prcedures! I like the sound of the McRaven house. Spooky fun! Honestly, this is the first time I read about Vicksburg. Now that I have, I would love to visit though. I think I can spend an entire day at the Military Park. Great tip about hiring a licensed battlefield guide. I’ve never considered Mississippi as a travel destination before! I’d like to check out the homemade goods at the Levee Street Marketplace. I’d like to check out the brewery too! I’ll have to add it to my list! Ooohh! We plan to go to US next year and we will consider visiting this Mississippi’ mysterious town! Love to go to the mansions and the yesterday’s toy shops. Will keep your blog in mind! The casino sounds pretty cool Vicky! I’d hit it up for a few hours at least to have some fun. The region in general feels like a blast. I need to visit the Deep South a bit more, especially with spending a good deal of time back in the USA. Rocking post! Vicksburg seems to be rich in history! The ghost hunter in me sees your pictures and automatically starts to think of the paranormal. Great post!